A pineapple finial gives a classic look to this cast stone Henri Studio fountain. This classic traditional fountain is made of cast stone in an earthy Relic Lava finish, featuring a wide rondo pool with a decorative column and bowl topped with a pineapple finial. Water crests and flows over the bowl into the round basin below, creating serene, enjoyable sounds. Henri Studio was started more than 40 years ago when Tuscan sculptor Eneri Prosperi came to the U.S.A. He combined master hand-sculpting techniques with cast stone, a highly dense material with a texture similar to limestone. Made from a special cement blend of coarse and fine minerals, pigments, and water, it is enriched by exclusive finishes that convey vivid natural stone highlights in subtle organic tones. Please note this hand-crafted, custom made-to-order design ships for free, but may require freight curbside delivery due to its size and weight. 56" high x 52" wide x pool is 10 1/2" high. Weighs 869 lbs. Hand-made in the USA by Henri Studio. Custom made-to-order; please allow extra time for delivery. Due to the hand-crafted nature, each may vary slightly. Relic Lava finish, cast stone construction. 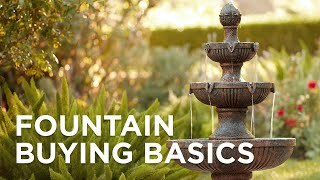 Can a light kit be added to this fountain? BEST ANSWER: Yes you can. I have added a link below to some possible options. How hard is to install one of these? and how does it age? does it fade and peel under the sun? BEST ANSWER: The assembly of the fountain is fairly easy. It includes detailed instruction on how to assemble. The fountain will not peel or fade under the sun. We recommend using a water treatment to prevent algae and Chlorine build up. Add a peaceful water feature with this hand-crafted cast stone pool and pedestal fountain. Add this bird motif cast stone fountain to your decor as a serenenatural accent. Place plants in the trough which surrounds the four water reservoirs that the grooved bowl top overflows into for an impressive lush display.